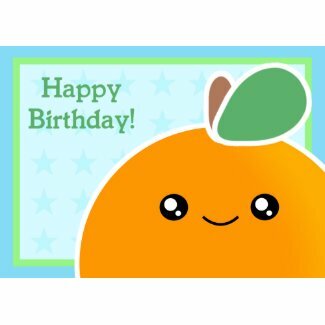 Need stickers for a kawaii sticker swap? Or just looking for some cute kawaii stickers to add to your collection? 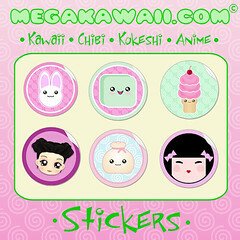 Mega Kawaii has sets of 20 regular size or sets of 6 large 3 inch stickers. Offering kawaii, anime,chibi and kokeshi doll sticker sets. Link: Super cute fun mega kawaii store! Get your Mega Kawaii super cute yummy posters half off! Kawaii Cupcakes, Cute Chibi Ballerina's and More. 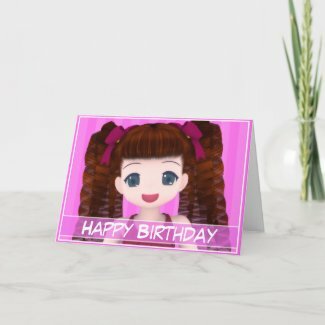 Anime Birthday Card is sure to please that special someone on their birthday. Adorable classic anime girl with curls and bows in her hair. Super sweet expression!